Stay 2 Nights for $640! Experience the splendor of Priest Lake, Idaho while staying at Nicklaus House, your best choice for a vacation rental home. Golf enthusiasts will appreciate being adjacent to the Priest Lake Golf Course. For hikers and bikers, miles of mountain trails are easily accessible. Located on the sixth fairway of the Priest Lake Golf Course, Nicklaus House is minutes away from Hill’s Resort, with its restaurant, lounge and outside deck overlooking Priest Lake. Relax and enjoy great menu items. During your stay at Nicklaus House, you’ll enjoy the luxurious comfort of a large 4,000 square foot vacation home with all the amenities you need. A list of Nicklaus House’s amenities includes spaciousness, comfort and entertainment. The ground floor includes a cavernous living room with comfortable seating, a welcoming stone fireplace, cathedral ceiling and a full bar (not stocked). A fully equipped kitchen, kitchen island and a spacious dining room with seating for 8 people make for relaxing meals. 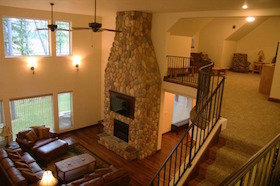 Upstairs is a large gaming and entertainment area. Outside, a large, covered patio is a great place to grill and entertain. Nicklaus House has two large master bedrooms, one on the ground floor and another upstairs, and each with a King-sized bed. The ground floor bedroom has its own fireplace, big-screen TV and patio entrance. 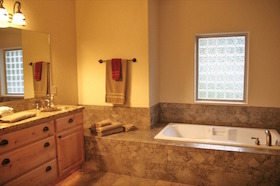 Relax in a spacious Jacuzzi® tub or enjoy the separate enclosed shower in the comfortable marble master baths. 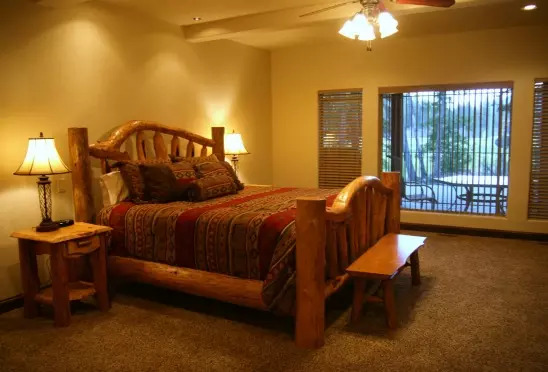 Upstairs is a third bedroom, decorated in a western motif and log accents. It has two Queen beds and a separate bathroom with shower. Whether you watch the big game with a group of friends, relax while watching a movie, or play a board game with the kids, you will find ways to unwind at Nicklaus House. The living room and upstairs entertainment area have wide-screen televisions with 200 channels of DirecTV®. In addition, the entertainment area comes complete with a Blue-Ray player, DVD and VCR. Finally, wireless Internet is available in every room via HughesNet®. At Nicklaus House, everything is designed to provide you with the perfect vacation experience. You’ll get the comfort you want and the convenience you need, all at a rate that fits within your budget. Call today at (509) 994-2563 or contact us online to book your minimum 2-night stay. © 2019 Nicklaus House. All Rights Reserved.